It’s almost the big day! Your rehearsal dinner is the perfect opportunity to relax and enjoy the celebration with your wedding party, family, and friends. Make it special with a few of these ideas for inspiration. 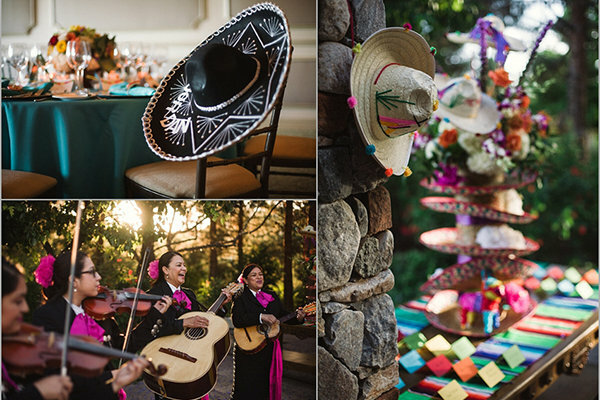 A colorful fiesta theme is instant fun. Go all out with a Mexican menu — don’t forget the mojitos! Head out to the ranch for a cowboy cookout, or simply transform your backyard with gingham, mason jars, and other rustic décor. Treat your wedding party to a beachfront luau, complete with traditional Hawaiian music and hula dancing. Build your theme around a favorite location or hobby, like this beach and fishing-themed celebration held near a marina with gorgeous sunset views. Think outside the box. Guests at this Goonies-themed rehearsal dinner enjoyed the cult classic on an inflatable movie screen. An innovative locale, such as this elegant art gallery, sets the scene for an unforgettable celebration. Enjoy the sun and sand with a scenic waterside location. Opt for a romantic winery setting. A beautiful dockside location is perfect for a sunny, warm weather rehearsal dinner. Take your crew to the bowling alley for a laid-back get together with casual fare. Have fun with a unique invitation, like this vintage postcard with a movie billboard design. Map out the festivities with a custom map. Be creative and add special locales, like the scene of your first date or the proposal site. You’ve planned a fun weekend! Get all the details in one place with a charming custom itinerary. Share your love story with a customized and printable dinner menu. Set the stage and introduce the cast of characters with a fun playbill program. Thank the ones who helped make it happen with this lovely printable dinner menu. Honor your wedding party and special guests with pretty heart wine glass charms. Tomorrow’s the day, and it’s going to be fabulous! This hand painted sign is made from reclaimed wood. He stole your heart... these clever cups foretell tomorrow’s big event. Creativity is key for a fun and vibrant décor. Add bright and cheerful garden flowers to these multi-hued tin cans for a knockout centerpiece. Let ‘em know you’re “getting hitched”! One more day! Count down to the main event with custom cocktail napkins. Think beyond the formal plated dinner for your menu. Guests at this casual but stylish affair enjoyed wood-fired build-your-owns pizzas. Everyone loves an old-fashioned barbecue. Direct your guests to the fun with this handmade rustic signage. A beach lobster fest is perfect for your nautical theme or destination wedding. Get your guests up and mingling with an interactive food station like this oyster bar. Enjoy some brews before “I dos” with this chalkboard craft beer menu. Offer a taste of what’s to come with “wedding cake” popcorn. DIY a popcorn buffet with custom flavored seasonings and labels from In Nonna's Kitchen. Offer a signature beverage like this oh-so-pretty spring blossom cocktail. You’ll want to pop open a bit of the bubbly. Even better: DIY champagne popsicles with pretty edible flowers. All you need is love... and ice cream. Add these cute wooden spoons for a sweet treat. The rehearsal dinner is your chance to have some fun with a colorful and quirky cake design, like this lovebird cake. You’ll definitely want some tunes. Music can enhance your décor and theme — this rehearsal dinner held in a rustic restored barn featured a banjo player and fiddler. Imaginative entertainment keeps things lively. This dreamy island celebration included swaying palm trees, a steel drum band, and exciting fire dancers. Gather around the fire pit. S’mores would be a nice touch. Rustic outdoor dinner? Let your guests hitch a ride on the haywagon. Keep your littlest guests — and their parents — happy with kid-friendly food and games. Spell f-u-n. Challenge your guests to a game of giant lawn Scrabble. Try beer bottle “wedding ring toss,” handmade from rustic repurposed cedar. Add sparkle to the action with a custom glittered vintage croquet set. Go big or go home with giant-sized dominoes or Jenga. Get the golfers out on the green for a fun putting contest. Pick teams for a friendly game of corn hole with these custom corn hole boards, upcycled from reclaimed wood. Your guests will enjoy sharing memories of your love story. Create instant memories of the festivities with a Polaroid camera station. Offer a trivia challenge based on your theme, like this '80s trivia game. Welcome everyone to the festivities with customized gift bag notes or tags. Have a Coke with your wedding party! Custom labels make for a fun beverage and a great favor. Every dinner guest will offer words of wisdom to the happy couple with these double-duty coasters. Sow the seeds of love. Seed packets are a sweet and simple rehearsal dinner favor.